Food stays at the Table: how to increase compliance with that rule. I feel like a broken record. “Food stays at the table.” All day long. I finally found a solution that made us all happy. Sort of. Our Little Nugget had a hard time keeping her food at the table. She really liked watching Trolls and eating granola bars at the same time. 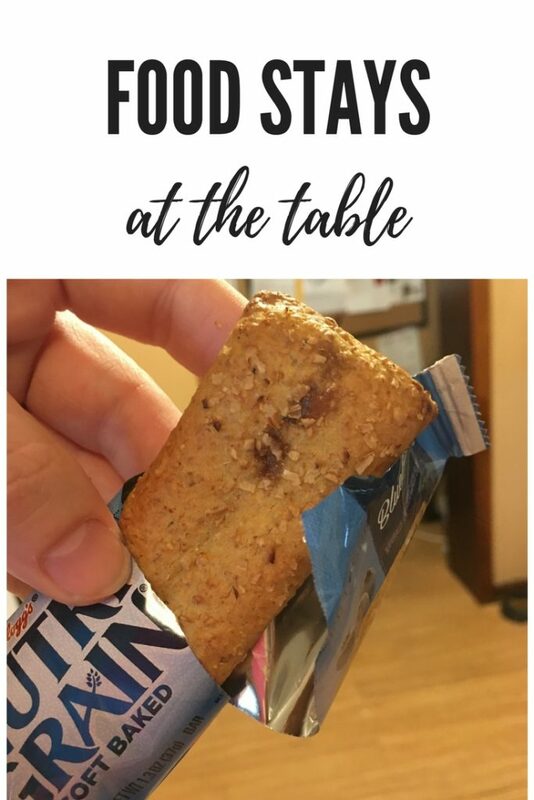 Granola bars make lots of crumbs. Each time she did this I brought her and her food back to the table and reminded her, “food stays at the table.” As soon as I was not looking, she wandered off back to the couch next to the TV. It seemed like a silly battle to choose, but I really didn’t want her to eat on the couch. What was I going to do? When a child is having difficulty changing her behavior, try changing the environment. Duh. Move the furniture. All she wants is to watch tv while eating. I don’t have a problem with her eating and watching TV at the same time. What I had a problem with was her eating food on the couch. They say choose your battles wisely, and I needed to pick my battle. Ultimately I decided to rearrange the dining table and den chairs just a bit so that she could see the TV from her chair at the table. I moved her “spot” to the other side and rotated the table around so that both spots saw the tv so that both of them would stay at the table. Now she could see the TV while eating food at the table. No more having to make the agonizing decision between Dora and Goldfish. But did it work? Yes! It did! Think about it. Why does she want to eat on the couch? Because she wants to watch trolls and eat at the same time. But if she sat at her “spot” she was blocked from the TV because of the way we had our living room arranged. When my biological children were younger, we taught them to keep food at the table (except special occasions) from an early age, and there was never a struggle with them obeying. The new babies clearly didn’t have that rule at their house before, so they were having a hard time remembering it at our house. They were having a hard time changing their behaviors to meet my expectations. I labeled their spots, so that the other children (or parents) in the house wouldn’t sit there, then blocking access to the spots that were in view of the TV. Did I want her watching tv all the time? No. Did I want to encourage more TV watching? No. but ultimately keeping at the table was more important to me because….crumbs. If we were eating meals together, I turned off the TV. There was no resistance. There was no wandering off because we were all there interacting with the whole family. The problem was really only when she was eating a snack and no one else was sitting at the table with her to keep her company. PROBLEM: She was not keeping food at the table. RESULT: I still had to reminder her and correct her occasionally, but it was waaaaaaaaaay less. Picking your battles is a piece of advice I hear often. This is a perfect example. The battle I picked was keeping crumbs off my furniture and food at the table. The battle I did not choose was enforcing a “no watching TV while eating” rule at the same time. I was ok with that. If we as parents or teachers try applying the “change the environment” technique rather than jumping straight to “change the behavior” more often, we may have better compliance.